Photograph depicts two miners standing on either side of wooden sluicing trough in rocky area. Man on left pans for gold. Hills in background. 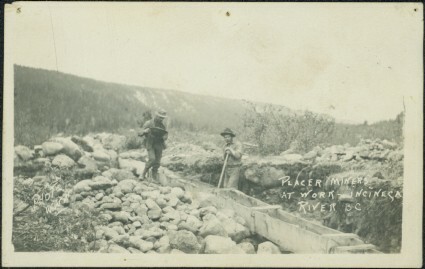 Handwritten annotations on verso of photograph: "PLACER MINERS AT WORK INGINECA RIVER BC", "PHOTO WWW". Item is part of the Taylor-Baxter Family Photograph Collection. See also item 2009.5.2.47 for similar content. Photograph was printed on post card paper.